Expand your horizons by using one of the search engines we recommend for "surfing the net". 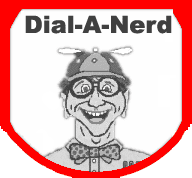 Select "Search DialANerd.com" above to search this website only. Bing - has great new pictures daily. Dogpile - meta search engine (for power users). Yahoo - catalogs by category.